Plenty of bloggers (including this guy who unforgiveably calls our neighborhood "wack") have written up the former Studebaker showroom on Bedford and Sterling, now enjoying a new lease on life as a landmarked building housing 27 low-income units. The ten-second history of the building is this: it was built in 1920 when Bedford between Fulton and Empire was Brooklyn's "Automobile Row," and it was recently renovated and preserved (nice little NYT article here) by a community-minded developer who wanted to both preserve the beauty of the area and provide affordable housing (he's apparently a good friend of the Easter Bunny). And it looks really freakin' cool. For a wonderful comprehensive essay on the place, check out this piece on Brownstoner. 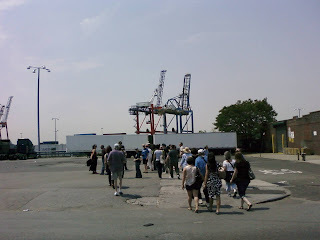 I joined author Tom Folsom and nearly 50 fellow Brooklynites last Saturday for a tour of Carroll Gardens and Red Hook that offered sites and stories from the legendary Gallo-Profaci/Colombo mafia war of the 1960s. The event was part of a monthlong series to promote Folsom's new book The Mad Ones: Crazy Joe Gallo and the Revolution at the Edge of the Underworld, which, while I haven't read it yet, sounds like a thoroughly fascinating and entertaining piece of local history. Folsom was engaging and energetic in person and knew his material inside and out, so much so that he frequently interrupted one good story with another, and the day was perfect, as a late-May day can be. 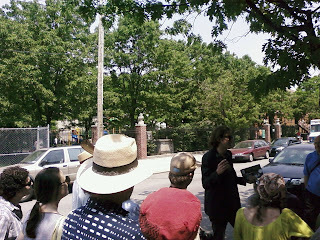 The tour, which started in Carroll Park and wound down to the waterfront, took a little over an hour and was comprised primarily of vignettes and anecdotes about the years of Joe Gallo and his gang. There were plenty of pulpy tidbits for mob/mafia enthusiasts, including a fantastic rundown of Gallo gang nicknames (Punchy, Big Lollipop, Little Lollipop), and several interesting cultural references: Joe Gallo modelled himself on Tommy Udo, a ganster from the Richard Widmark flick Kiss of Death, and in turn inspired a whole movie (The Gang That Couldn't Shoot Straight) and several pieces of mafia lore that were canonized by The Godfather (released in the year of Crazy Joe's dramatic death in front of Umberto's Clam House). Folsom was at his best telling these stories, cracking us up with portraits of lethal mobsters puttering around setting up their coat racks in tenements that they used as barracks. Leaving all of this aside (go buy the book for more! 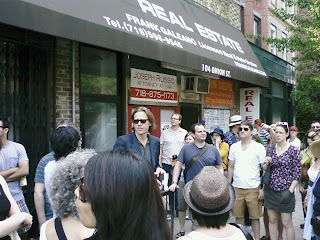 ), the tour was made as interesting by what we didn't or couldn't see as by what we did. 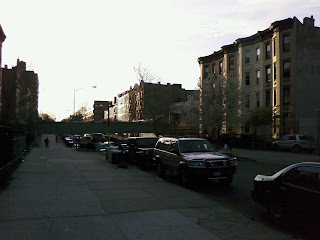 After a few blocks in bucolic Carroll Gardens, enough to see the funeral home where Joey's casket lay, we crossed the exhaust-spewing trough that is the BQE (first photo) and ambled into what remains of "Brooklyn's Little Italy." 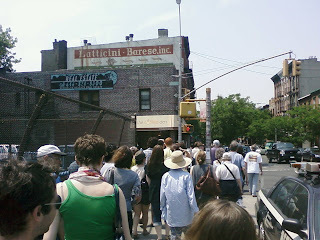 We stood on the corner of Columbia and Union Street (second photo) while Folsom described a bustling commercial avenue at the terminus of a trolley line that connected Red Hook to the rest of Brooklyn. What's left today is the amputated arm of what was once the biggest port in the United States, a perfectly nice place to live but no longer a hub, with nearly as many open lots as buildings. On the waterfront (third photo), as Folsom explained the various connections between the longshoremen and stevedores unions and the mob, we stood in what is today almost completely an industrial ghost town. Though a few operational container cranes remain, the last in Brooklyn, they sit far away behind locked gates and serve ships with a minimum number of skilled laborers, a far cry from the Brooklyn waterfront as Brando or Arthur Miller depicted it. 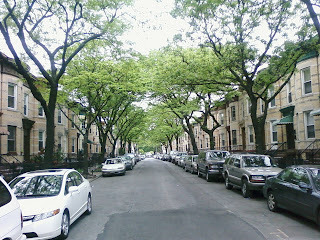 Our tour guide saved the starkest contrast for last--on President Street, where the Gallo boys "went to the mattresses" (coining the term) in a tenement owned by their grandmother, Folsom stood spinning tales admidst a low-rise development of brick townhomes with verdant lawns and leafty trees overhead. As Folsom described a lethal stockpile of grenades, shotguns, and ammunition that the gang hoarded in the tenement, a young girl rolled by on her scooter in a rainbow-colored bathing suit while her neighbor and his father chased a soccer ball in our direction. 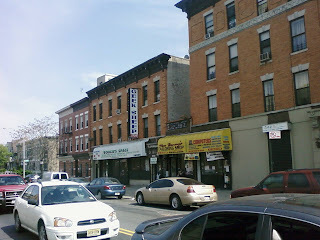 President Street also housed the abandoned (now demolished) Catholic Church where Joey's funeral mass was held. The unlikihood of the girl in her striped swimsuit was no accident: what happened on the Red Hook waterfront nearly 50 years ago is consigned to history along with the possibility of repetition. By pulling apart a neighborhood, the BQE pulled apart the longstanding ties that made "going to the mattresses" in your grandma's building possible. Unsentimental planners and policemen were doubtless happy to see the area (deemed a slum during urban renewal) revamped and re-invented, but changes of that magnitude can't be accomplished without losing something. The Mafia isn't exactly what we think of when we think "community organizations" today--they're a reminder that "community" is a neutral word, and can describe parochial inwardness as quickly as it does cohesive continuity. But regardless of what you think of them, they are history, at least as Brooklyn knew them half a century ago, for the place that birthed them is no more. 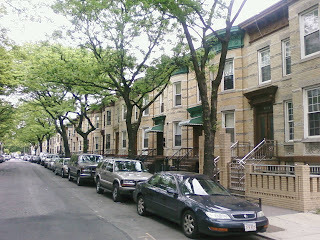 Just some photos today, from some well-preserved rowhouse blocks in Bushwick's northeast corner around Irving Square. I'd like to withdraw a quarter-pounder . . . Author Camilo Jose Vergara published a great slideshow of bank conversions from around the Northeast and Midwest on Slate a day ago, lending some mass-market appeal to a favorite topic of historically-minded bloggers, including Forgotten NY and yours truly. Of the mighty old banks that now do retirement duty as restaurants, clothing outlets, or strip clubs, Vergara writes "they were designed to impress and reassure." His piece ends with a rumination on the changing function and design of local banks and branches, accompanied by two photos of a former KFC being converted to a Capital One branch. "No longer needing to appear solid, permanent, and respectable," he muses, "a bank now can be housed in a flimsy former fast food outlet." 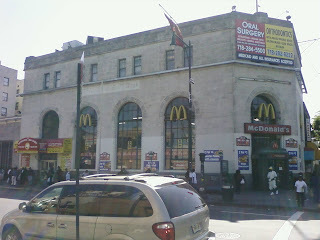 In a reversal of Vergara's closing example, the former Lincoln Savings Bank at Nostrand and Church is now a very sturdy-looking McDonald's. 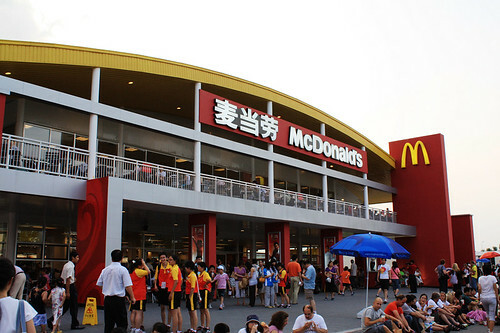 The quintessential "flimsy fast food outlet" has made a habit of building big in certain cities, but this particular iteration of the golden arches struck me as interesting for a couple of reasons. First, they kept the original entrance, a stately wrought-iron and glass vestibule that leads into the former lobby. 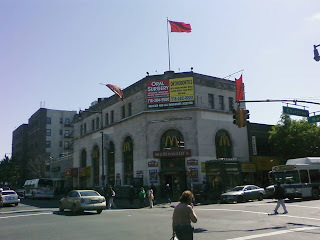 Secondly, while it's no suprise that they re-branded the place (arches abound), the red-and-yellow McDonald's flag flying from the impressive main flagpole struck me as a bridge too far. By all means, cover the windows, deck the halls, and paper the facade with your logo--but why not fly, I don't know, the American flag from your flagpole? 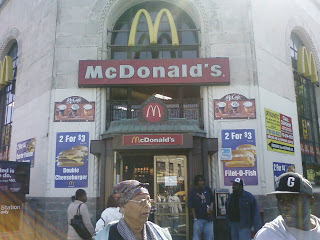 It's not as though McDonald's has every shied away from embracing its All-American image. It seems worth mentioning that in defense of Vergara's thesis, some rather unspectacular bank buildings are close by. At least we know our happy meals are safe in the vaults. 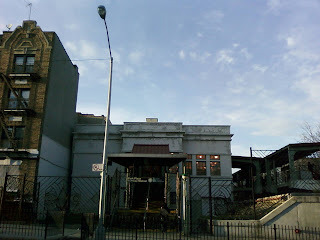 Pacific Street in Crown Heights has a light-industrial feel to it, but peeking through the car repair shops and MTA workshops is the fantastic sculpture above. Reminiscent of the classic 1930s-era skyscraper-construction photos, the piece sits atop the entrance to Piscopo Iron Works, formerly of Red Hook. The owner, Franco Nogara, is a Sicilian immigrant with over 50 years of experience in the ironworking business, whose work is remarkable enough to have earned him a NYTimes article 17 years ago. 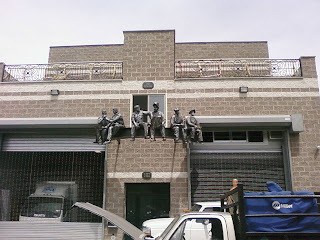 As a final piece of ironworking history, the men depicted in the images and sculpture were most likely Mohawks, who made up the bulk of the high-rise workforce from the 1930s-1960s, temporarily settling in Boerum Hill. 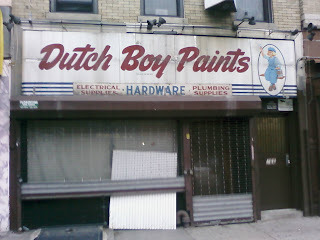 Whoever is renovating the former M&J Home Center on Franklin between Lincoln and St. John's unearthed a treasure over the weekend when they pulled the awning down, revealing a well-preserved hardware store sign advertising Dutch Boy Paints. According to the company history, the ad went up between 1957, when they adopted the logo seen above, and 1967, when they tweaked the image to include the company name on the boy's hat (and made the boy himself slightly more exuberant). 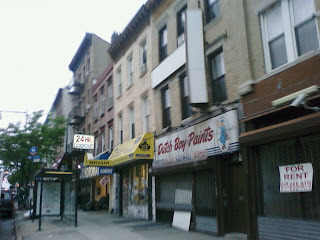 Lost City found a similar sign in Midwood last year, which seems to date from the same era. So who's the Dutch Boy? An Irish-American kid from Jersey, whose image was captured by American painter Lawrence C. Earle when the National Lead Company changed its name to Dutch Boy Paints in 1907. 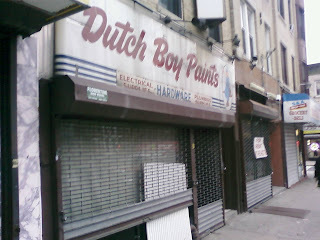 The name refers to the "Dutch Process" of producing lead paint, which originated in 16th-century Holland. 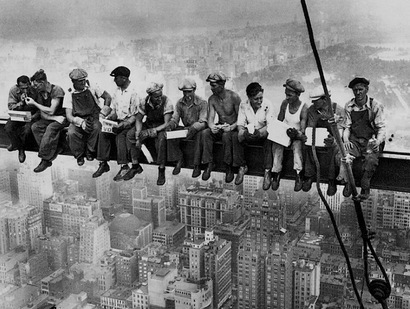 The image became such a hit that a painting trade magazine, the Carter Times, went out and found the original model, Michael Brady, 24 years later in 1931. He was living (where else?) in Brooklyn, and his stint as a model had inspired him to study painting and drawing. When they tracked him down, he was drawing cartoons for the Brooklyn Daily Eagle, and penned this autobiographical sketch for their article. The Brooklyn connection doesn't stop there. 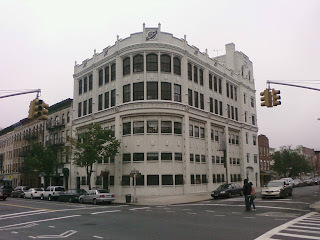 One of the corporations that amalgamated into the National Lead Company in the late 19th century was the Brooklyn White Lead Company, founded in 1825 by local banker and financier David Leavitt. An avid art collector himself, Leavitt partnered with Augustus Graham, who used his share of the profits to build an "Apprentices' Library" to provide wholesome leisure for the working man. Graham's institution grew into the Brooklyn Museum, where a portrait of Leavitt's wife now hangs. So, as it happened, the white-lead industry of Brooklyn gave the borough a museum, a cartoonist, and a fabulous old sign on Franklin Avenue. I hope the new owners at 766 Franklin are planning to keep it, but if not, I hope the Brooklyn Museum can find a place for it. Park Place was looking lovely the other day as I walked home in the late afternoon sun. I stopped for a shot of the station, thinking that it would have a good bit of history behind it (a WPA product, perhaps? ), only to find that it was totally rebuilt in 1998-1999 to look like a vintage station on the old BMT lines. Well done, MTA--it looks just right. - The Park Place stop on the shuttle is the only shuttle station in the entire NYC system that is never served by another train. -The tunnel that starts south of the Park Place station on the shuttle line and runs through to the other side of Eastern Parkway is the oldest operation tunnel in the NYC Transit System. Finally, for a general timeline of NYC Transit History, click here. 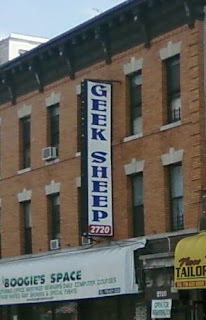 Ahh, Flatbush, home of sheep with pocket protectors and role-playing game addictions. You're reading that right: Geek. Sheep. Somewhat unsurprisingly, I'm not the first to notice this. Apparently, they're a wholesale livestock dealer. Apologies for not having a more interesting topic to post on, but come on . . . Geek Sheep! I found these anachronisms sitting on Chauncey Street just east of Ralph Avenue, and no amount of Googling would answer my question--why are they both still standing? 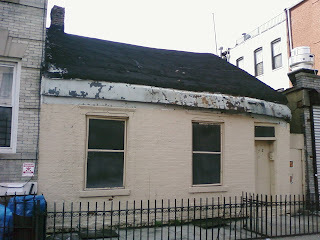 The first structure, house number 272, is dilapidated but inhabited, and the sloped-roof facing-front style is reminiscent of colonial and early 19th century houses. Still, it seems odd that this structure, which looks more like an outbuilding than a house, would have survived, especially given that it nestles so closely with the apartment building to the east of it, so perhaps it was built later. 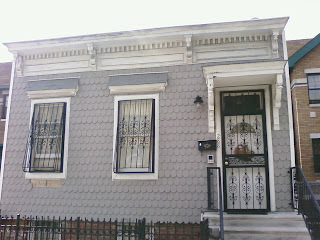 The second building, house number 268, is clearly a survivor, and looks a lot like other cute little houses from the mid-19th century around Bed-Stuy. In this case, it seems as though the owner was a holdout when a developer bought up the lots around them, and the result is the strange juxtaposition of this old house pressed against the sidewalk with driveways on either side leading to townhomes that looks less than 20 years old. I'm curious to find out more about these places, particularly the second one--maybe Bed-Stuy Banana or Bed-Stuy Blog can help. Recession or not, new signage is popping up along the Avenue. 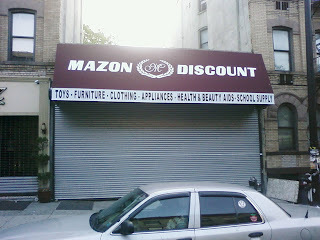 As I heard via Brooklynian's Crown Heights Forum awhile back, Mazon's Discount, the former tenant at what is now the giant hole on Eastern Parkway and Franklin, is reopening next door to 95 South, and they've got a handsome maroon awning out as of this weekend. 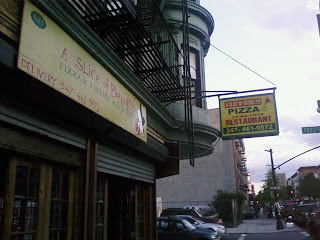 Further down the street, the nicest folks on earth at A Slice of Brooklyn (my favorite place to stop and chat on Franklin) have finally replaced the shingle for the former Motherland Restaurant with their own sign, which fits their color scheme but is a bit cluttered with text. 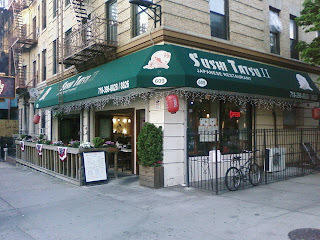 Sushi Tatsu II (the original shop is over on Flatbush) didn't change any permanent signage, but their whiteboard has a welcome announcement for all those who hoped that Mazon's new site was a coffee shop or restaurant in the works. 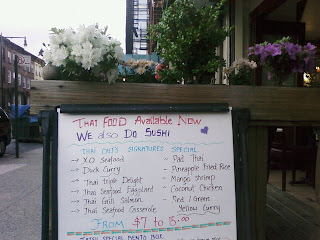 They are now serving Thai food, along with their full lineup of Japanese cuisine. With outdoor tables and some blooming window boxes, Tatsu is evolving nicely from a take-out joint to an eat-out restaurant, and the addition of Thai food should help them step out from Gen's shadow in the local Asian food scene. 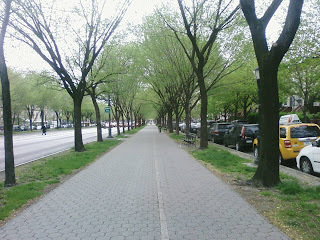 I don't think I suffer from seasonal affective disorder (the only condition with a perfectly descriptive acronym: SAD), but my heart still warms at the sight of green trees. Hooray for spring. Side note: thanks to OTBKB for organizing a great event at Brooklyn Blogfest, and to everyone who presented. Sue Rock welcomes me through her door with a smile that could give you a sunburn and immediately grabs a pile of fabric. "Look at all of this!" she exclaims, marveling herself, "we have more than you could possibly believe, and we get more every day. We can't do anything BUT work with it." 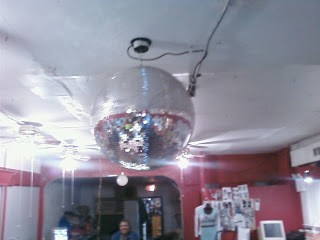 The basement space, a former after-hours night club with its disco ball still hanging proudly, is stocked to the rafters with textiles of all varieties, arranged on shelves, in boxes, and in piles on tables. 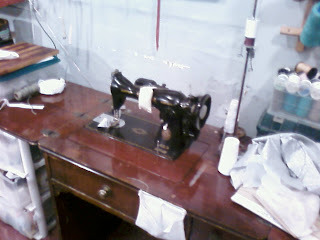 In the middle of the main room, a square of tables holds the sewing machines, at which her husband Babafemi and daughter P.J. are working on their latest projects, while on the wall above them hangs thread and yarn of every color. 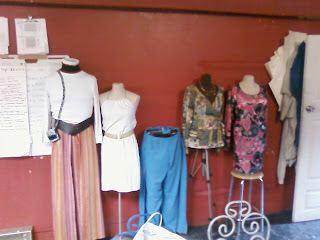 Towards the front, a few mannequins and several more shelves and racks hold finished clothing, which Ms. Rock pulls out with abandon. "This piece was done for us by a woman from Denmark. Her friend told her about us when she moved here," she says, displaying a hand-knit sweater that could easily fetch $50 at a boutique. "This one is from a woman in Maryland." She darts to the rack by the door and pulls off a shimmering, gauzy 3/4 length collared piece that looks straight off the runway. "Fantastic, right? Now dig this," she says, pulling a gauzy curtain of the same design from a box on the floor. I've found my way to Sue Rock Originals, a Crown Heights non-profit whose remarkable mission could best be summarized as the bringing of joy, healing, and community through textile arts. To be more clear: Sue Rock founded her non-profit over four years ago to reach out to survivors of domestic violence. They do so in two ways: most of the clothing and accessories they produce are donated to survivors, and many of the volunteers who make their products are themselves survivors. Sue speaks passionately theraputic value of working with fabric, not just for domestic violence survivors but for anyone. "Everyone's stressed out these days, but it's even worse to be stressed out and not know how to do anything," she says. "This is a way for people to repair and revitalize our lives." It's also a handy skill, one that can bring people together and bring in money (or at least save it). "There was a time when everyone could do this--everyone's great-grandparents could sew, or knit, or crochet. 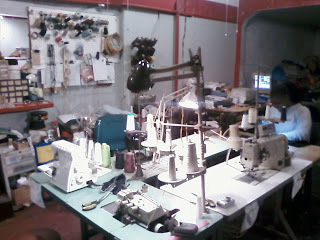 We could stand to get back to that," Sue notes, and indeed, her shop feels in many ways like an old-time tailor's, with mother, father, and daughter happily at work together. Donated fabric is what holds the whole operation together--stacks and stacks of it, culled from cast-offs from interior design firms and fashion houses. As Sue explained to me, a big firm will order up ten times what they need for each season (a "send us one of everything" approach) and then dump the unused fabrics as soon as they've made their decisions for that season's line. When Sue Rock Originals started up nearly five years ago, they made calls through the Craigslist Free Fabrics listings and happened upon 13 huge garbage bags of vintage Italian interior design fabric. A pile of discarded curtains might not strike most people as a good omen, but Sue Rock knew better. "You can't lose," she says. "We have so much now, and it was all for the sake of asking. I would just call people and say "Hi, dig, I've got this idea, would you mind donating?" They now have a series of relationships they can count on, with new donorations coming in all the time. While approaching five years of good work, Sue Rock Originals just opened their Crown Heights shop this winter. The building was owned by Sue's father, George C. Hargett, a local resident since his 1930s boyhood who passed on in February (Read about him in Sue Rock's words here) and left the store to Ms. Rock and her brother. The building itself, which Mr. Hargett bought 25 years ago for a pittance from the city at auction, had been a rooming house before he converted it to one-bedroom apartments, and was still a night club. However, the lessee of the latter establishment packed his bags the same week Mr. Hargett died, and Sue Rock Originals moved in. From their new home, they are reaching out to the neighborhood with a series of events and classes to bring more people into their circle of volunteers and textile enthusiasts. The sign out front advertises knitting classes from 3-5 on Tuesdays, and they are now hosting a bi-monthly make-your-own lingerie party, complete with drinks and materials, on Friday nights. For the whole family, there will be a Mother's Day Crafts event this Saturday, May 9, from 1-4pm. Out back, they have a garden which they plan to make liberal use of this summer. Anyone who wants to hone their craft or learn from scratch is welcome, and if you donate your work, the materials are free. "There are people all over doing this, knitting and crocheting" says Sue, "so we just supply the yarn and let them work." 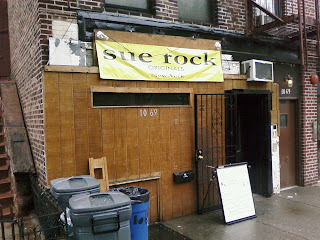 Sue Rock Originals is open Tuesday - Saturday from 10am-5pm at 1069 Bergen Street. Swing by! It's turned into local merchant week here at I Love Franklin Ave! 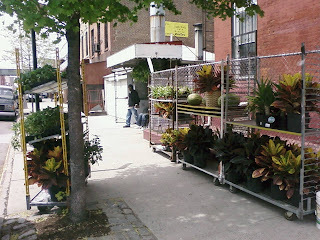 Today we salute the gentlemen who sell plants out of the old hot dog stand on Dean just off Franklin. In the summer, their ferns, herbs, and flowers are a welcome patch of green on a rather industrial few blocks of Dean Street. They bring their wares out as soon as the weather is warm enough, and their presence last week was a sure harbinger of spring (it may have rained for three straight days, but the sun is shining as I write this). On some nights they've got fresh whole watermelons out of a truck, too. I admired the fading sign on this old three-story storefront on Franklin in a post a few months back, but on Saturday I stopped for a chat with Stanley Jones, the proprietor, who sits outside with a few boxes of clothing for sale when the weather allows. Jonesy, as he introduced himself, has owned the building since 1963, when he bought it from a Jewish family called the Meltzers. As he tells it, "I was a young many then, working in shipping from a shop on Sterling and Rogers. One day the woman from the shop came by to see me, and asked how much I was paying in rent. I told them I was paying $204 a month, cheap in those days, and she told me she had a place for sale on Franklin that she would sell to me, because, she said, she had never seen a young man work so hard." 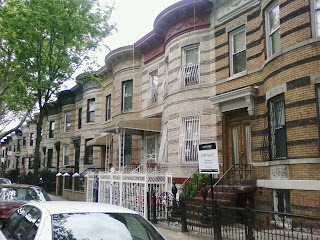 A few days later, he met the Meltzers at their home on Eastern Parkway and Washington Ave, and they confirmed their willingness to sell the shop to him. 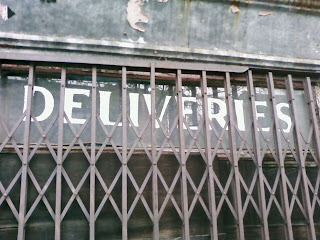 It had been a grocery (as evidenced by the fading "Groceries, Flour & Feed" banner painted between the windows), but was then in use as glass shop. The young Jonesy, who was working double shifts, went to the bank that stood on the corner of Eastern Parkway and Franklin (now replaced by a giant hole that may one day become condos), and asked the clerk to check his life savings. 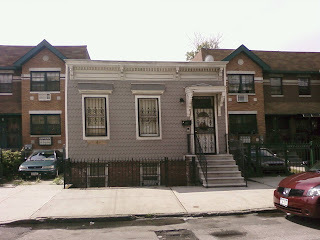 The answer came back that he had enough to buy the place, and he went back to the Meltzers to confirm the sale. They did one better than he expected, offering not only to hold the mortgage privately, rather than going through the bank, but to let him pay it off as quickly as he could, thereby reducing their profit from interest. With a laugh, he adds "and they only asked for $50 at the closing!" Jonesy has been there ever since, and the store looks exactly as it did when he bought it in 1963. "I can't change it" he says, "because it's an historic building." Around him, Germans, Irish, and Jews have moved out, and successive waves of western-hemisphere immigrants, first Jamaicans and Trinidadians, than Guyanese, and then Panamanian, have moved in. An old man now, Stanley Jones doesn't plan to go anywhere. "I've worked hard, and I'm doing fine," he says. "When I need help, I'll ask for it." Like a fool, I left my camera at home this weekend, but that didn't keep me from swinging by the new flea market at Franklin and Sterling. Organized and hosted by Bristen's Eatery, the market will run from 9am-6pm all summer long and feature a wide variety of vendors. Nostrand Park spoke with Bristen's about their long term plans on Friday, which include bringing in an organic farmer to sell produce and having local musicians perform. I wandered up at the end of the day as the market was winding down, and had a long, pleasant chat with Jason, a vendor selling his homemade, small-batch sauces under the label "The Pour Gourmet." He had three sauces on offer, two of which (his standard 14-spice barbeque sauce and a variant with lavender) had sold out. The third, which I sampled, was his latest creation, a tangy pineapple and sweet pepper sauce that was fantastic with the plantain chips he had for tasting. A 20-year veteran of the restaurant industry, Jason told me that all of his sauces were made in his home kitchen a block away, with ingredients that he had purchased within a mile radius. "The Prospect Park Greenmarket is as far as I'll go" he said, adding that he loves the living and working in the neighborhood. He's planning to expand his line of sauces and marinades, and is hoping the flea market will help him gauge and meet demand for products in the area. "One person told me that they can't find a really good honey mustard dressing anywhere nearby," he noted. "I can do that." Each batch of Jason's handiwork only produces about 10 jars of sauce, which disappeared this Saturday at $5 a pop. Check out the Pour Gourmet at the Franklin at Sterling Flea Market for the rest of the summer. 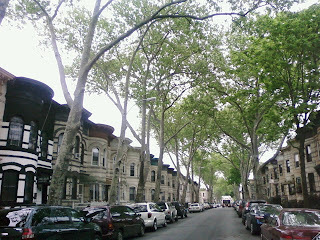 UPDATE (5/4): Jason's partner Ayelet keeps a blog on her life and times (and neighborhood) here. Check it out!